I, for one, refuse to find any humor whatsoever is this dastardly poking of fun at such a beloved beverage! Beloved indeed. 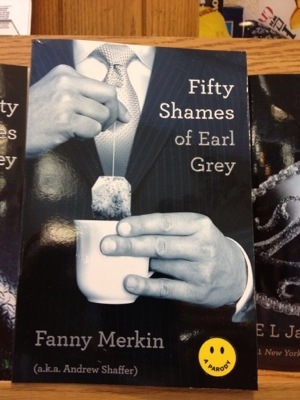 I think the title is actually spit your tea out funny. It is clever on more than one level. I walk into Starbucks Coffee, Peet’s Coffee, Caribou Coffee, and any other coffee coffee shop and shamelessly indeed proudly order Earl Grey tea. I look the coffee barrista right in the eye and ask for the largest most grande of sizes. Gary, steep your tea with pride. You are not alone.